5 When shall we bring, to be appeased, the Hero, Lord of warrior might, Him, the far-seeing Varuṇa? 6 This, this with joy they both accept in common: never do they fail The ever-faithful worshipper. 7 He knows the path of birds that fly through heaven, and, Sovran of the sea, He knows the ships that are thereon. 8 True to his holy law, he knows the twelve moons with their progeny: He knows the moon of later birth. 9 He knows the pathway of the wind, the spreading, high, and mighty wind: He knows the Gods who dwell above. 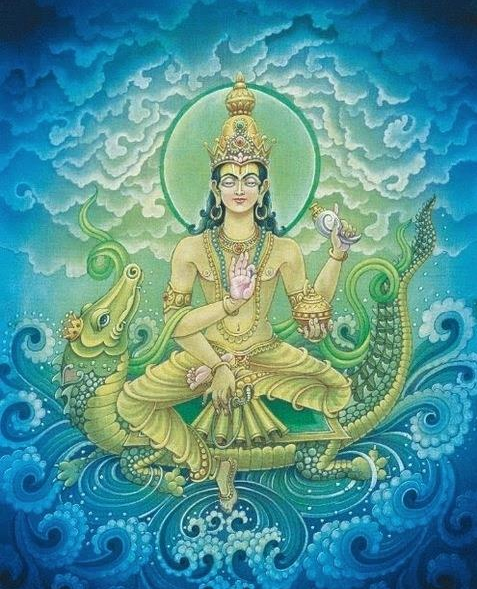 10 Varuna, true to holy law, sits down among his people; he, Most wise, sits there to govern all. 11 From thence perceiving he beholds all wondrous things, both what hath been, And what hereafter will be done.